My Daily Art Display today enters the world of trompe l’oeil. The term is French and literally means “trick of the eye”. It is a kind of artistic illusionism which gives the appearance of three-dimensional realism. This story of trompe l’oeil originated in ancient Greece. Pliny the Elder records in his Natural Histories the famous confrontation between two Greek 5th Century BC painters, Zeuxis and Parrhasius who were involved in a painting contest. Each would try to make a picture that produced a more perfect illusion of the real world. Zeuxis painted a likeness of grapes so natural that birds flew down to peck at them. Then his opponent, Parrhasius, brought in his picture covered in a cloth. 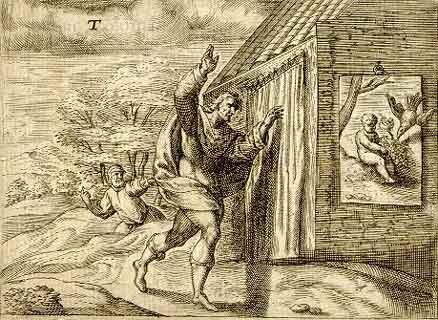 Reaching out to lift the curtain, Zeuxis was stunned to discover he had lost the contest. What had appeared to be a cloth was in reality his rival’s painting. The early precursors of modern trompe l’oeil appeared during the Renaissance, with the discovery of mathematically correct perspective. 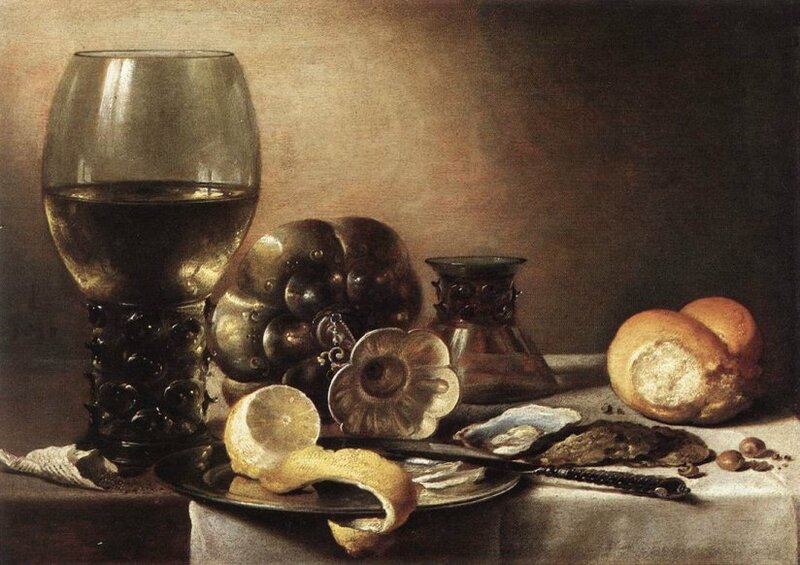 But the fooling of the eye to the point of confusion with reality only emerged with the rise of still-life painting in the Netherlands in the l7th century. Trompe l’oeil sets itself apart from ordinary decorative painting by its intent to mislead the observer, and it is this which sets it apart from ordinary still-life painting. The artist’s technical ability is meant to go undetected and, with use of perfect perspective, cleverly observed light and realistic colours, the ploy is to make the viewer believe that a flat surface is not actually flat, or that a space exists where there, in fact, is no space. A trompe l’oeil painting is one which shows apparently three dimensional objects and spaces in a way which the eye accepts as realism in the context of their surroundings. The new genre soon spread throughout Europe and America. 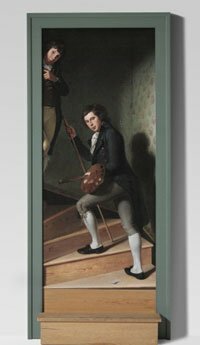 In American art, we have the Charles Willson Peale’s painting of 1795 entitled The Staircase Group (Portrait of Raphaelle Peale and Titian Ramsay Peale), which is housed in the Philadelphia Museum of Art. Peale executed this painting to prove that he was still one of the city’s preeminent artists. 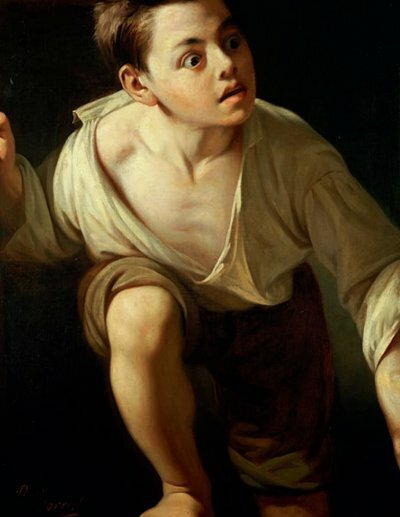 On a very large canvas, he made one of his rare full-length portraits, showing two of his sons on an enclosed spiral staircase. 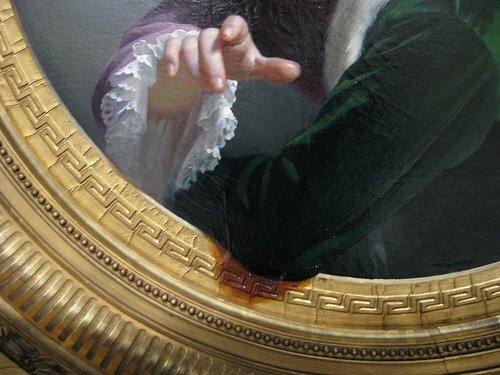 The high degree of detail and finish shows that the painting was undoubtedly intended to be a trompe l’oeil, an effect that Peale had never attempted before. 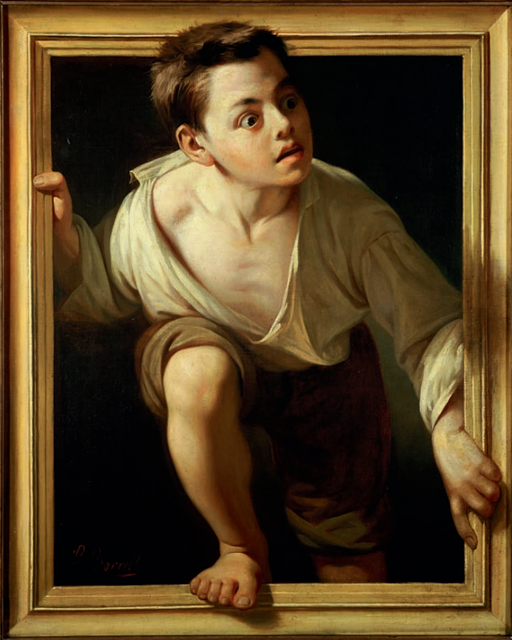 To enhance the illusion, he set up the painting within a doorframe in his studio, with a real step in front. Rembrandt Peale, another son, recalled that his father’s friend George Washington, misled by Peale’s artifice, tipped his hat and greeted the two young men as he walked by! Though highly regarded by collectors, from the beginning art theorists often rubbished trompe l’oeil as the lowest category of art. These “wise” men regarded it as a mere technical tour-de-force that did not require invention or intellectual thought. However in the l7th century, leading trompe l’oeil artists were not only receiving acclaim and acknowledgement from many quarters they were seen as also pushing the boundaries of the genre. 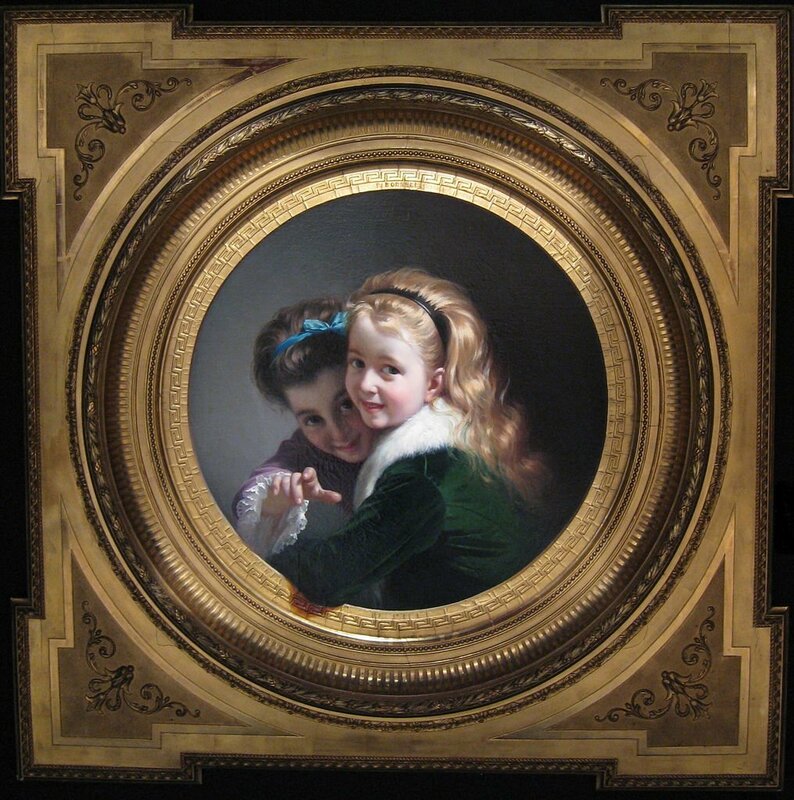 My Daily Art Display’s featured painter today, Samuel van Hoogstraten was even awarded a medal for his services to Art by the Emperor Ferdinand III, the Holy Roman Emperor, after being so impressed by one of his trompe l’oeil paintings. 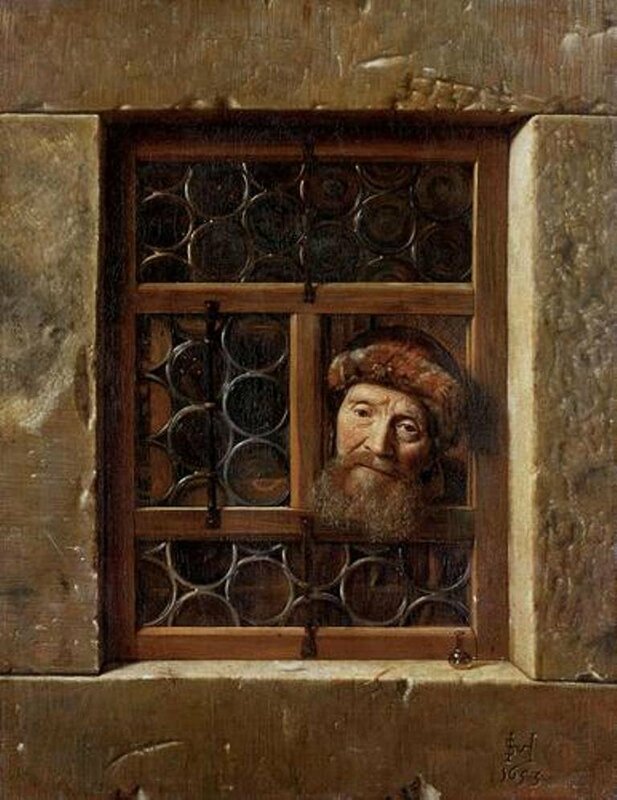 My Daily Art Display featured painting today today is entitled Man at the Window which Hoogstraten completed in 1653 and now hangs in the Kunsthistoriches Museum in Vienna. Look how the artist’s has splendidly portrayed the old man’s wrinkles and the graying of his beard. The old man’s brow is furrowed and his head is slightly angled. See how much detail the artist has given the window. On the sill outside the window he has added a small vase which enhances and emphasizes the depth in the painting. This window ledge is shaped by a stone wall surrounding the window. Look at the amazing amount of detail Hoogstraten has put into his depiction of the texture and surface of the stonework. You can almost believe that if you touched the surface of the painting it would feel like stone. It is quite amazing. Also on the windowsill, the artist has added a feather and a couple of leaves, one of which hangs over the side of the sill. We see the man’s head protruding from one of the panes in the window and this gives the appearance that he is actually coming out towards our space. Although it is a kind face there is something very haunting about it. One can easily imagine that as an observer passes this painting and glances at it, they suddenly imagine that they are being watched by this elderly but real person. Today’s artist, besides his many trompe d’oeil works, completed many varied paintings and in a future blog I will look at the life of Samuel van Hoogstraten and another of his paintings. 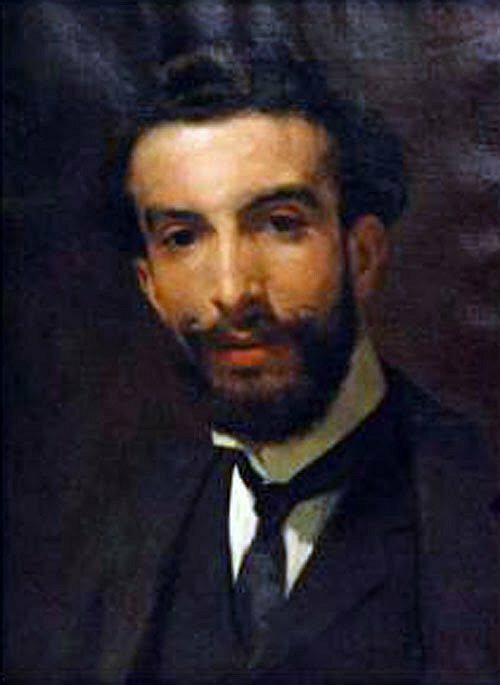 He was not only a very talented painter but also a writer on art. 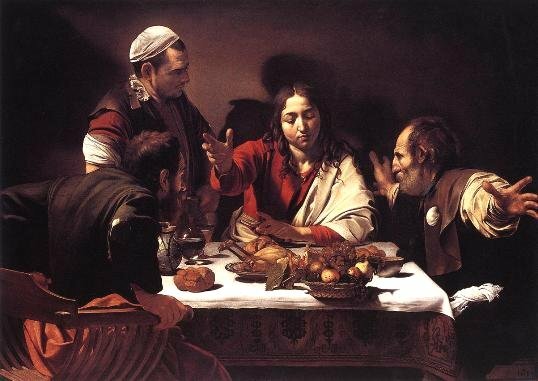 He painted genre scenes in the style of de Hooch and Metsu, and completed many portraits, but maybe he will be best remembered as a specialist in perspective effect.